Those who attended this past weekend's music festival still had complaints about spotty coverage. 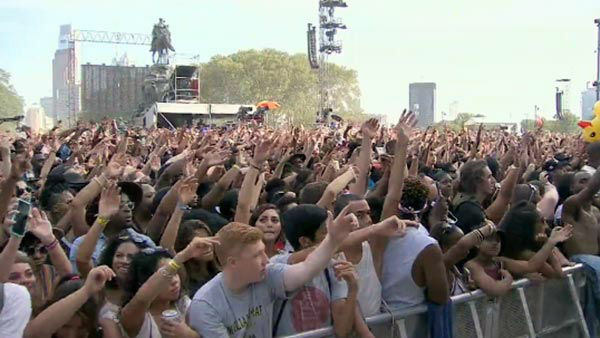 CENTER CITY (WPVI) -- The tens of thousands who attended this past weekend's Made in America music festival enjoyed the acts and tested the cell phone coverage prior to the papal visit. They voiced some complaints via social media. On Twitter Tuesday, @eaglesflyer74 posted "Nothing would load whether it was Snapchat, Twitter, or the Made in America app." @jackievanz tweeted, "Yes, little to no service on day 1. Day 2 was a little better depending on how thick the crowd was at the time." @sarahbloomquist @6abc yes, little to no service on day 1. day 2 was a little better depending on how thick the crowd was at the time. And @zreeseplus tweeted, "Yeah dawg. Cell phone towers overwhelmed. Couldn't make or receive any calls. Happened on the 4th, too." @sarahbloomquist @6abc Yeah dawg. Cell phone towers overwhelmed. Couldn't make or receive any calls. Happened on the 4th, too. Since last year, the cell phone providers have invested millions to upgrade their systems in Center City. "We invested about $24 million to effectively quadruple our network capacity here in the downtown area," John O'Malley of Verizon Wireless said. AT&T invested a similar amount. They upgraded permanent towers, put up temporary towers, and tested newly-installed mini towers - part of the Distributed Antenna System or DAS. Engineers tested the signals at the festival and monitored coverage remotely. Verizon and AT&T saw limited, temporary problems in specific areas like near the main stage. "But for the most part, what we saw was pretty good network performance," O'Malley said. Thousands gathered on the Ben Franklin Parkway Saturday to listen to their favorite artists at the fourth annual Made in America music festival. Mayor Michael Nutter, who at the MIA festival, said City Hall hadn't received complaints. "We don't have any levels of reports indicating that there were issues or challenges out there. I made any number of phone calls out on the grounds," Nutter said. Cell providers are going over the data from the weekend. For the pope, more mobile towers will be added and existing towers tweaked to ensure papal visitors can send their tweets. "We still have work to do over the next couple of weeks," O'Malley said. Verizon says the expectation is your cell phone should work if you are at the papal mass. The mayor says if you have complaints about the coverage, call your cell phone carrier directly.